After missing out on the first year of the world championship because German drivers were still not allowed to compete immediately after the war, Germany joined the series in 1951 after the ban was lifted. The venue was the daunting 14.17-mile Nurburgring. Ferrari, fresh from its first win in the British Grand Prix a fortnight earlier, brought four works cars for Villoresi, Taruffi, Ascari and their new hero Gonzales. There was also an interesting strategy because Fangio's Alfa Romeo would require two pit stops while the Ferraris only need one. Fangio needed to make a strong start and build up a decent lead. At his first pit stop he dropped behind Ascari and Gonzales. But by the time he made stop No. 2 it appeared he had enough of a lead to hang on to the finish - except his car would not re-start for a few vital seconds. 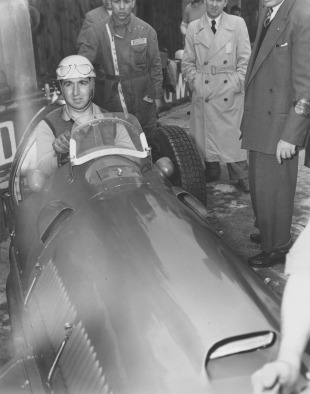 Ascari also had an advantage in that he had driven the circuit in a Formula Two race in 1950 while for Fangio it had been a steep learning curve over the previous few days. He also had difficulties with the gears after slamming his car into a bank during practice. In fact Ascari did make a second pit stop to change a wheel and still won by 30 seconds over Fangio. Although he had won a number of non-championship races, it was the first championship win for the man in the blue short-sleeved shirt. All Fangio's Alfa Romeo team-mates retired so Gonzales finished third ahead of the fellow Ferrari drivers Villoresi and Taruffi. Swiss privateer Rudi Fischer completed the point scorers. "I was aching with every bone in my body," Fangio said. "I wondered how I was still in one piece and how I wasn't thrown out of the car. With no seat belt, and what with flying up and down and going over bumps, and knocking from left to right in corners, I ended up pulverised."